• Benzodiazepines increase the risk of fatal overdose when taken in combination with opioid analgesics, alcohol, or other central nervous system depressants. • Avoid co-prescribing benzodiazepines and opioid analgesics because of the risk of fatal respiratory depression. *The guidance in this document is not intended for end-of-life care. While benzodiazepines are commonly prescribed for anxiety and insomnia, they are not considered first-line treatment for either condition 2,5-9 (Box 1 2,5-15 ). Guidelines recommend that benzodiazepines be used only for symptomatic relief of severe anxiety 2,5,7,10,11 and short-term treatment of severe insomnia, 2,6-8,11,12 while waiting for the full effect of other treatment modalities. 5-7,10,12 Despite these limited indications, benzodiazepines are often prescribed more broadly and as long-term treatment, 2,5,8 and this overuse contributes to risk of misuse and overdose. You can reduce the risk of benzodiazepine-involved overdose by providing appropriate first-line treatment for anxiety and insomnia, prescribing benzodiazepines judiciously only when clinically indicated, and tapering patients off long-term benzodiazepine treatment. • Benzodiazepines bind to GABA receptors and depress the central nervous system. • They are prescribed for their sedative-hypnotic, antianxiety, muscle relaxant, and anticonvulsant effects. Myth: Benzodiazepines are first-line treatment for anxiety. Myth: Low-dose benzodiazepines are not addictive. Myth: Z-drugs (eg, zolpidem, zaleplon) are safer than benzodiazepines. Assess for underlying causes of anxiety and insomnia 2 and consider safe, effective nonbenzodiazepine treatments when indicated 11 (Boxes 2 2,5,8,10-12 and 3 2,5,10,12,18-20 ). If short-term benzodiazepine treatment is indicated, fully assess your patient, prescribe the lowest effective dose for the shortest duration and talk with your patient about the benzodiazepine prescription. • Screen for substance use as part of routine care 11 (Resources for Providers: Screening and Monitoring Tools). • Review all current medications for potential interactions (Table 1 2,12,21-23 ) and consult with your patient’s other prescribers. • Check the Prescription Monitoring Program (Box 4 5,9,10,12,24), as required before prescribing any schedule IV drug. • Avoid co-prescribing benzodiazepines and opioids because of the risk of fatal respiratory depression. • Begin treatment with the lowest recommended dose and adjust as needed based on the patient’s response 2,12 (see Table 2 21,25-39 for information). 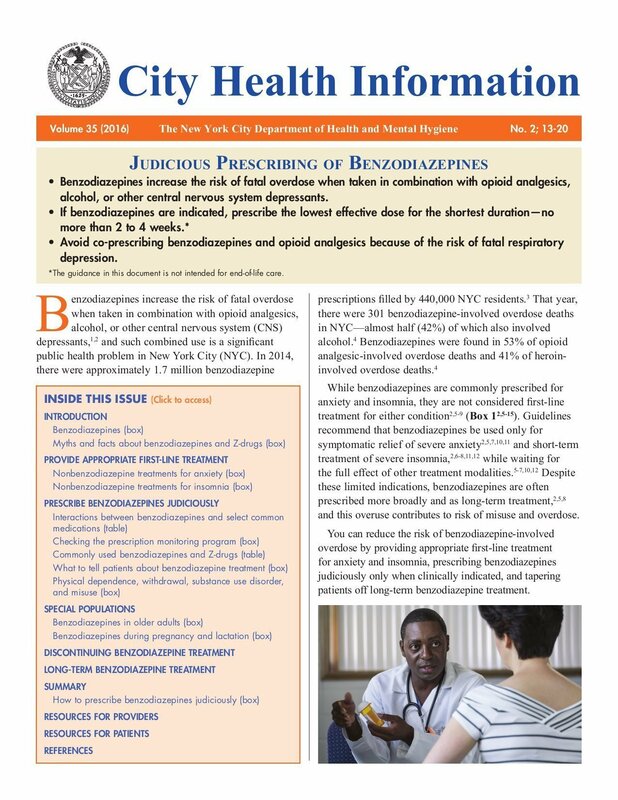 Educate patients about the benefits and risks of benzodiazepine treatment (Box 5 2,6,7,9,11,12 ), and remain alert to signs and symptoms of physical dependence, withdrawal, substance use disorder, and benzodiazepine misuse 2,10,11 (Box 6 2,40,41 ). Consult product prescribing information for detailed warnings, precautions, contraindications, and potential interactions. The New York State Prescription Monitoring Program (PMP)provides quick, confidential, 24/7 access to your patients’controlled substance prescription history. 1. Consult PMP to determine whether your patient recently filled a prescription for an opioid analgesic, benzodiazepine, or other controlled substance. • Discuss your concerns with your patient, explaining the risk for overdose when benzodiazepines are used with other agents (especially opioid analgesics and other CNS depressants). • Communicate and coordinate with your patient’s other controlled substance prescribers. ◦ Withdrawal can be severe, causing hallucinations, seizures, and in rare cases has been life-threatening (see page 16). ◦ A taper schedule is strongly recommended and clinically appropriate versus refusing continuation of this medication (Resources for Providers: Dose Reduction Plans). • Consider that your patient might be misusing controlled substances and/or have a substance use disorder (see page 16). ◦ If needed, explain that effective treatments for substance use disorder are available, and treat the patient yourself or refer for treatment (Resources for Providers: Treatment for Substance Use Disorder). ◦ For opioid use disorder, discuss and arrange for medication-assisted treatment (eg, buprenorphine or methadone) (Resources for Providers: Treatment for Substance Use Disorder). As of August 2013, all practitioners are required to review the PMP prior to prescribing any controlled substance listed on schedules II, III, or IV. See Resources for more information about PMP. Use caution when prescribing benzodiazepines for patients aged 65 and older. 2,5-7,9,11,12,15,42,43 Older adults are particularly vulnerable to the adverse effects of benzodiazepines. (Box 7 2,5-7,9,11,12,15,42-45 ). Benzodiazepines should be avoided during pregnancy because of the risk of adverse outcomes for the newborn 2,12 (Box 8 2,7,12 ). • You’ll be taking this medicine for a short time—no more than 4 weeks. 7,12 If your symptoms don’t improve in a few weeks, we’ll reevaluate the treatment plan. • Make sure to tell other providers that you’re taking this medicine. Some other medications can have a serious interaction with this one. • Keep the medication in a secure place, preferably locked. • Do not share your medication with others. • Take the medication exactly as directed. ◦ Dispose of the medicine safely. Mix it with an unpalatable substance like coffee grounds or kitty litter and place in a sealed container before discarding with your trash. Or find a medication disposal event near you (Resources for Patients: Medication Take-Back Programs). ◦ Mood or behavior changes, including depression, anxiety, or irritability. ◦ Substance use disorder: Some patients who become physically dependent on or misuse the medicine can develop a substance use disorder. • Seek help right away if you think you may be developing tolerance or dependence or if you experience side effects—especially ones that are new or concern you. • Physiologic adaptation to a substance requiring the person to take more of the substance to achieve a certain effect. • Can occur with the chronic use of many drugs—including many prescription drugs, even if taken as instructed. • Causes drug-specific withdrawal symptoms if drug use is abruptly ceased. • Maladaptive pattern of use leading to significant impairment or distress. See DSM-5 diagnostic criteria (Resources for Providers: Screening and Monitoring Tools). • Using someone else’s benzodiazepines or using benzodiazepines in a manner other than prescribed. • May or may not be associated with physical dependence. • Signs may include pattern of early refills; prescription problems such as lost, spilled, or stolen medications; and escalating drug use in the absence of a physician’s direction. • Determine and agree on a gradual dose reduction plan with your patient (Resources for Providers: Dose Reduction Plans). Benzodiazepines used with opioids, alcohol, and other CNS depressants can lead to fatal overdose. Reduce the risk of preventable overdose deaths by using nonbenzodiazepine treatments, prescribing benzodiazepines judiciously only when clinically indicated, and tapering patients off long-term benzodiazepine treatment. • Provide appropriate first-line treatment for anxiety and insomnia. ◦ avoid co-prescribing with opioids or other CNS depressants because of o the risk of fatal respiratory depression. • Royal Australian College of General Practitioners. • Substance Abuse and Mental Health Services Administration. • Anxiety and Depression Association of America. 1. Jones CM, Paulozzi LJ, Mack KA. Alcohol involvement in opioid pain reliever and benzodiazepine drug abuse-related emergency department visits and drug-related deaths?United States, 2010. MMWR Morb Mortal Wkly Rep. 2014;63(40):881-885. www.cdc.gov/mmwr/preview/mmwrhtml/mm6340a1.htm. Accessed May 3, 2016. 2. Royal Australian College of General Practitioners. Prescribing drugs of dependence in general practice, Part B: benzodiazepines. 2015. www.racgp.org.au/your-practice/guidelines/drugs-of-dependence-b. Accessed January 21, 2016. 3. New York State Prescription Monitoring Program, unpublished data. 4. Paone D, Tauzon E, Nolan M, Mantha S. Unintentional drug poisoning (overdose) deaths involving opioids in New York City, 2000-2014. Epi Data Brief. 2015. No. 66. Updated March 2016. www1.nyc.gov/assets/doh/downloads/pdf/epi/databrief66.pdf. Accessed April 8, 2016. 5. Cloos J-M. Benzodiazepines and addiction: myths and realities (Part 1). Psychiatric Times. 2010. www.ama.lu/docs/Psytimes_part1.pdf. Accessed March 8, 2016. 6. Maine Benzodiazepine Study Group. Guidelines for the use of benzodiazepines in office practice in the state of Maine. www.benzos.une.edu/documents/prescribingguidelines3-26-08.pdf. Accessed January 21, 2016. 7. The College of Psychiatry of Ireland. A consensus statement on the use of benzodiazepines in specialist mental health services. June 2012. www.benzo.org.uk/amisc/eire12.pdf. Accessed January 21, 2016. 8. Ashton H. Guidelines for the rational use of benzodiazepines. When and what to use. Drugs. 1994;48(1):25-40. 9. JPS Health Network. Prescribing and tapering benzodiazepines. Behavioral health virtual resource. 2014. www.jpshealthnet.org/sites/default/files/prescribing_and_tapering_benzodiapines.pdf. Accessed January 21, 2016. 10. Eagles L. Guidance for prescribing and withdrawal of benzodiazepines & hypnotics in general practice. NHS Grampian. 2008. www.benzo.org.uk/amisc/bzgrampian.pdf. Accessed January 21, 2016. 11. GroupHealth. Benzodiazepine and Z-drug safety guideline. 2014. www.ghc.org/all-sites/guidelines/benzo-zdrug.pdf. Accessed January 21, 2016. 12. Ireland Department of Health and Children. Benzodiazepines: good practice guidelines for clinicians. 2002. health.gov.ie/blog/publications/benzodiazepines-good-practice-guidelines-for-clinicians. Accessed January 21, 2016. 13. Ashton CH. Benzodiazepine dependency. 1997. www.benzo.org.uk/bzdep.htm. Accessed May 5, 2016. 14. Liappas IA, Malitas PN, Dimopoulos NP, et al. Zolpidem dependence case series: possible neurobiological mechanisms and clinical management. J Psychopharmacology. 2003;17(1):131-135. 15. Diem SJ, Ewing SK, Stone KL, Ancoli-Israel S, Redline S, Ensrud KE. Use of non-benzodiazepine sedative hypnotics and risk of falls in older men. J Gerontol Geriatr Res. 2014;3(3):158. 16. Paone D, Bradley O’Brien, D. Benzodiazepines in New York City: misuse, morbidity, and mortality. Epi Data Brief. 2012. No. 18. www1.nyc.gov/assets/doh/downloads/pdf/epi/databrief18.pdf. Accessed April 8, 2016. 17. Chen LH, Hedegaard H, Warner M. Drug-poisoning deaths involving opioid analgesics: United States, 1999-2011. NCHS Data Brief. 2014(166):1-8. www.cdc.gov/nchs/products/databriefs/db166.htm. 18. Mitchell MD, Gehrman P, Perlis M, Umscheid CA. Comparative effectiveness of cognitive behavioral therapy for insomnia: a systematic review. BMC Fam Pract. 2012;13:40. doi:10.1186/1471-2296-13-40. 19. American Academy of Sleep Medicine. Healthy sleep habits. www.sleepeducation.org/essentials-in-sleep/healthy-sleep-habits. Accessed March 10, 2016. 20. Harvard University. Twelve simple tips to improve your sleep. healthysleep.med.harvard.edu/healthy/getting/overcoming/tips. Accessed March 10, 2016. 21. Dhwani Shah DB, Borresen D. Benzodiazepines: a guide to safe prescribing. Carlat Report. 2011. www.thecarlatreport.com/free_articles/benzodiazepines-guide-safe-prescribing. Accessed January 21, 2016. 22. Indiana University School of Medicine. P450 drug interaction table: abbreviated “clinically relevant” table. medicine.iupui.edu/clinpharm/ddis/clinical-table/. Accessed March 8, 2016. 23. Miller DD. Atypical antipsychotics: sleep, sedation, and efficacy. Prim Care Companion J Clin Psychiatry. 2004;6(Suppl 2):3-7. 24. O’Brien CP. Benzodiazepine use, abuse, and dependence. J Clin Psychiatry. 2005;66(Suppl 2):28-33. 25. Estivill E, Bove A, Garcia-Borreguero D, et al. Consensus on drug treatment, definition and diagnosis for insomnia. Clin Drug Invest. 2003;23(6):351-385. 26. Farinde A. Benzodiazepine equivalency table. Updated May 15, 2014. Medscape. emedicine.medscape.com/article/2172250-overview. Accessed May 5, 2016. 27. Ashton CH. Benzodiazepine dependence and withdrawal: an update. Drug Newsletter. 1985;31. www.benzo.org.uk/drcha.htm. Accessed May 4, 2016. 28. Halcion [package insert]. New York, NY: Pfizer Inc; March 2015. www.pfizer.com/products/product-detail/halcion. Accessed January 14, 2016. 29. Xanax [package insert]. New York, NY: Pfizer Inc; September 2013. labeling.pfizer.com/ShowLabeling.aspx?id=547. Accessed January 14, 2016. 30. Klonopin [package insert]. South San Francisco, CA: Genetech USA, Inc.; October 2013. www.gene.com/download/pdf/klnopin_prescribing.pdf. Accessed January 14, 2016. 31. Serax [package insert]. Philadelphia, PA: Wyeth Laboratories, Inc.; June 2000. www.accessdata.fda.gov/drugsatfda_docs/label/2001/15539s52lbl.pdf. Accessed January 14, 2016. 32. Restoril [package insert]. Hazelwood, MO: Mallinckrodt Inc.; November 2014. www2.mallinckrodt.com/WorkArea/DownloadAsset.aspx?id=1719. Accessed January 14, 2016. 33. Librium [package insert]. Costa Mesa, CA: Valeant Pharmaceuticals International; July 2005. www.valeant.com/Portals/25/Pdf/products/PI/Librium_Capsule_5-10-25mg_PI_Sep01.pdf. Accessed January 14, 2016. 34. Tranxene [package insert]. Deerfield, IL: Lundbeck, Inc.; April 2009. www.accessdata.fda.gov/drugsatfda_docs/label/2009/017105s075lbl.pdf. Accessed January 19, 2016. 35. Valium [package insert]. South San Francisco, CA: Genetech USA, Inc.; August 2015. www.accessdata.fda.gov/drugsatfda_docs/label/2013/013263s092lbl.pdf. Accessed May 5, 2016. 36. Dalmane [package insert]. Aliso Viejo, CA: Valeant Pharmaceuticals North America; April 2007. www.valeant.com/Portals/25/Pdf/products/PI/Dalmane_Capsule_15-30mg_PI_Sep01.pdf. Accessed January 14, 2016. 37. Sonata [package insert]. New York, NY: Pfizer Inc; May 2013. labeling.pfizer.com/ShowLabeling.aspx?id=710. Accessed January 14, 2016. 38. Ambien [package insert]. Bridgewater, NJ: Sanofi-Aventis US LLC; October 2014. products.sanofi.us/ambien/ambien.pdf. Accessed January 14, 2016. 39. Lunesta [package insert]. Marlborough, MA: Sunovion Pharmaceuticals Inc.; May 2014. www.lunesta.com/pdf/PostedApprovedLabelingText.pdf. Accessed January 14, 2016. 40. National Institute on Drug Abuse. Principles of Drug Addiction Treatment: A Research-Based Guide. 3rd ed. Revised December 2012. www.drugabuse.gov/sites/default/files/podat_1.pdf. Accessed March 8, 2016. 41. American Psychiatric Association. Diagnostic and Statistical Manual of Mental Disorders (DSM-5). Arlington, VA: American Psychiatric Association Publishing; 2013. 42. American Geriatrics Society. Choosing Wisely. Revised April 23, 2015. www.choosingwisely.org/clinician-lists/american-geriatrics- society-benzodiazepines-sedative-hypnotics-for-insomnia-in-older-adults/. Accessed March 8, 2016. 43. American Geriatrics Society 2015 Beers Criteria Update Expert Panel. American Geriatrics Society 2015 updated Beers criteria for potentially inappropriate medication use in older adults. J Am Geriatr Soc. 2015;63(11):2227-2246. 44. Allain H, Bentue-Ferrer D, Polard E, Akwa Y, Patat A. Postural instability and consequent falls and hip fractures associated with use of hypnotics in the elderly: a comparative review. Drugs Aging. 2005;22(9):749-765. 45. Glass J, Lanctot KL, Hermann N, Sproule BA, Busto UE. Sedative hypnotics in older people with insomnia: meta-analysis of risks and benefits. BMJ. 2005;331(7526):1169.